Sleigh bells ring, are you listening? 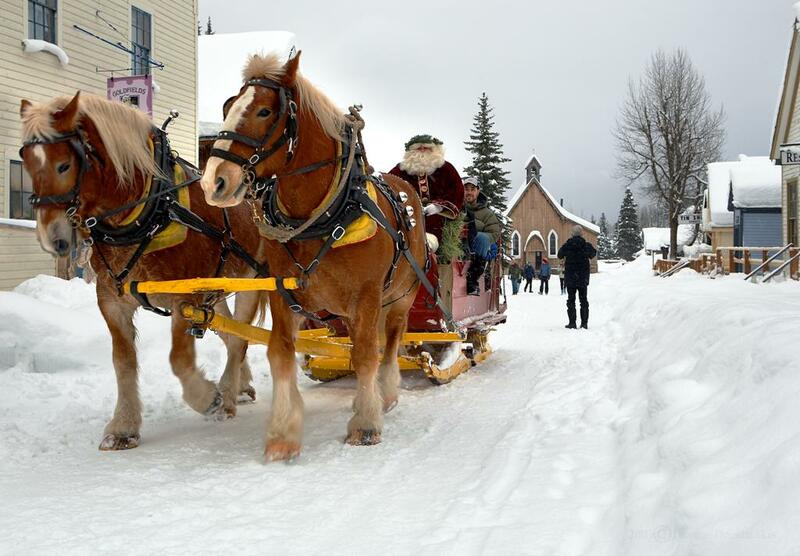 Come to Barkerville Historic Town this weekend and hear them jangle during a horse-drawn sleigh ride up the main street of BC’s Gold Rush Town. Experience the yuletide magic of western North America’s largest heritage attraction, nestled under the silence of an elegant shroud of snow. Barkerville will be open for business from 10am to 4pm daily from Saturday, December 7th to Monday, December 9th, and the National Historic Site will be bustling with special events and activities. But a stay at one of Barkerville’s exceptional onsite accommodations is only one of the many old-fashioned Christmas activities planned for weekend visitors. Daytime guests can to enjoy traditional Christmas carols sung by costumed interpreters, and sip some tasty apple cider while shopping for one-of-a-kind gifts and carefully crafted Christmas decorations at the Mason and Daly General Merchants, C. Strouss & Company Dry Goods, and McPherson’s Watchmakers and Jewelry Store. The Cameron and Ames Blacksmith Shop will be offering up hand-forged treasures and lumps of coal (!) for those with unusual “naughty and nice” lists to consider, and McMahon’s Confectionary is sure to satisfy the sweet tooth of the most carefully hung stocking. The Goldfield Bakery will have soup and sandwiches available for lunch, as well as traditional Victorian Christmas fare to take home, and a stop by the Wendle House is sure to whet the appetite with traditional baking and fireside conversation. Barkerville guests are encouraged to wander among a variety of beautiful museum displays and visit with Father Christmas himself in the “Enchanted Forest.” On Saturday and Sunday, twice per day, the Sheepskin Claim’s own Mr. Teach will be playing festive music at the Methodist Church, and on Sunday afternoon St. Saviour’s Anglican Church will hold its annual Christmas service at 3:00 pm. For those theatrically-minded visitors, a special performance of the one-man drama, The Fred Wells Show, will be available at the Kelly Saloon Saturday through Monday at 2:00 pm (tickets are $5.00 per person, all ages) and site-wide sleigh rides will be happening over all three days for a nominal charge. For more information on Barkerville’s spectacular Christmas events, please visit www.barkerville.ca.